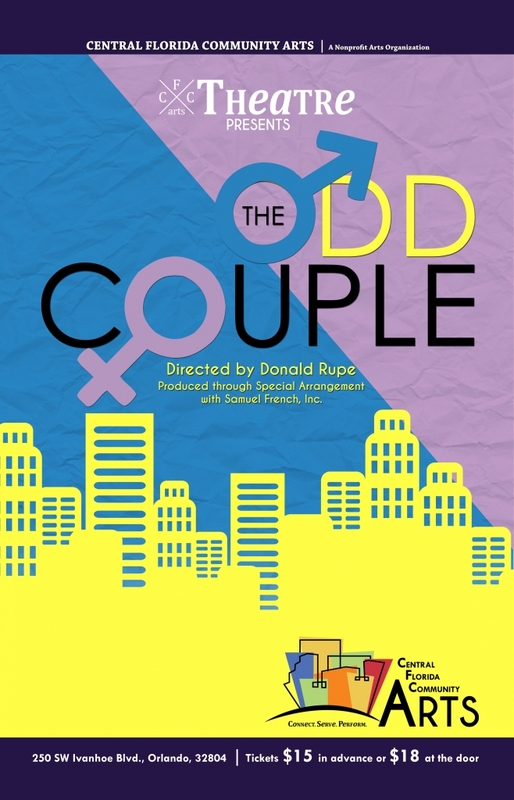 The CFCArts’ Theatre Program production in November is The Odd Couple! A classic comedy, written by Neil Simon! Two suddenly single pals – the sloppy one and the fastidious one – strain their friendship by becoming roommates and unconsciously repeating the same mistakes they made in the marriages they just left. Fastidious and depressed, one seems suicidal, but as the action unfolds, the other becomes the one with murder on the mind when the clean-freak and the slob ultimately decide to room together, with hilarious results. CFCArts will perform either the male or female version on any given performance night – see below for performance schedule! Different from our large scale Summer Broadway Season concert version production, this will be a creative, immersive, fully staged show in an intimate space. Experience this full-length comedy masterpiece, directed by Donald Rupe, in a whole new way! All performances will be at CFCArts’ Central Campus, which is housed on the grounds of Central Christian Church, 250 SW Ivanhoe Blvd., Orlando, 32804. Please park behind the church, going around the left side of the building, and taking care to turn before I-4 entry ramp, which is next to the church’s driveway. Seating for all The Odd Couple shows is limited and advanced purchase is strongly recommended. Guaranteed seating can be purchased in advance for $15 (credit card/Paypal) or, if available, can be purchased for $18 at the door (cash/check only). Tickets for Industry Night are just $12! Doors open 30 minutes before showtime and all seating is general admission..